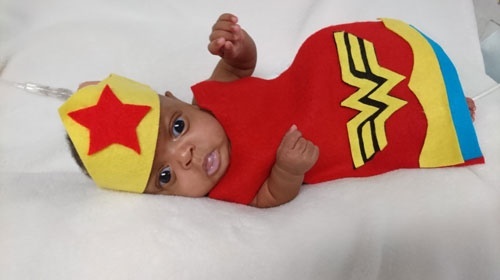 Dubbed a little Wonder Woman, micro-prem baby Jazeel Hlophe's incredible progress proves that with the right care miracles really are possible. Born at just 25 weeks and weighing only 395 grams, micro-premature baby Jazeel Hlophe is defying the odds as she grows stronger each day, so much so that she is expected to be discharged from hospital soon after World Prematurity Day, commemorated on 17 November this year. 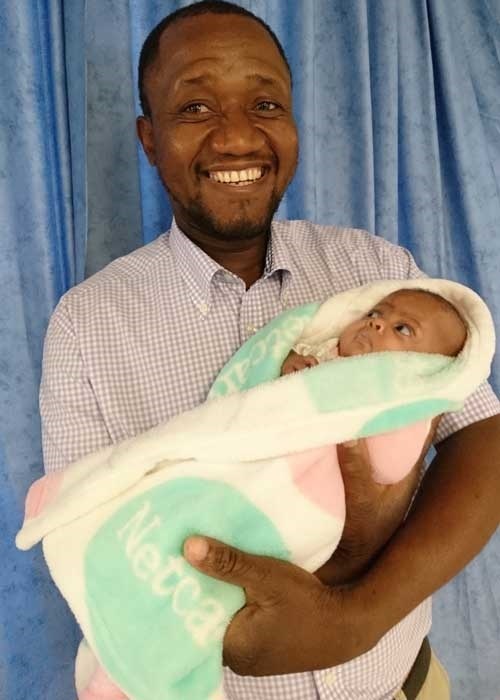 “Baby Jazeel was born extremely prematurely on 21 June this year, three months ahead of her anticipated due date of 3 October,” explains Dr Klaas Mnisi, a neonatologist practising at Netcare Clinton Hospital in Alberton. “There is still some debate as to whether babies born at a gestational age of between 23 and 25 weeks have a reasonable prospect of survival. However, when you see how well Jazeel is doing, it is most encouraging. "These days micro-premature babies have a better chance of surviving, and Jazeel is now thriving – she is one of the miracles who show us what is possible,” says Dr Mnisi, who points out that neonatology is a sub-specialisation of paediatrics. Neonatologist Dr Klaas Mnisi with his smallest patient, Jazeel Hlophe. Jazeel’s mother, Helen Sauls of Alberton, had pregnancy-induced hypertension, which led to the baby being born 15 weeks early, given the normal gestation period being 40 weeks. “I am very excited about the prospect of taking my baby home, but obviously we do not want to rush," says Helen. "She has been in hospital for nearly 150 days and has gained a lot of weight and strength in that time. Jazeel now weighs just over 2.2kg and now drinks the whole bottle when I feed her. I am so grateful to Dr Mnisi and the staff of the hospital's neonatal intensive care unit [NICU] for taking such good care of my baby,” Helen says. According to Dr Mnisi, virtually no studies have been done on babies who are born as prematurely as baby Jazeel. One aspect of the highly specialised care baby Jazeel received in the NICU was colostrum from the Ncelisa human milk banks, a specialised unit where donated breastmilk is provided to premature babies like Jazeel, the first of its kind in Africa. “Jazeel’s gut was immature due to her premature birth, and giving her colostrum was the best way to prepare her gut for future feeding,” Dr Mnisi notes. Mothers produce colostrum – also referred to as ‘liquid gold’ owing to its yellowish orange colour and highly beneficial properties – in the first few days after birth. It is highly nutritious and perfectly suits the needs of new-born babies, as well as being a rich source of natural antibodies to provide protection against disease causing bacteria and viruses. Sr Anina Klut, a shift leader of Netcare Clinton Hospital’s NICU, says that baby Jazeel has become a firm favourite with staff, having been in the unit for some four months. 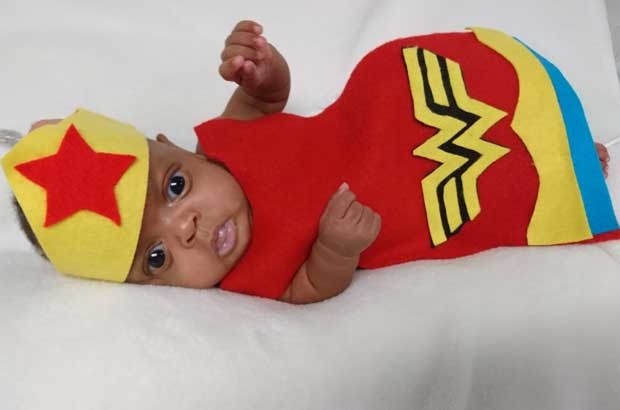 Sr Klut explains that the nurses wanted to do something special for baby Jazeel before she was discharged from hospital, and so they set to work making her a miniature Wonder Woman super heroine cape and embroidering a hospital babygrow with the words “Littlest Miracle”. Baby Jazeel in her miniature Wonder Woman super heroine cape. Speaking ahead of World Prematurity Day on Friday, Dr Mnisi says that the prospects for micropremature babies have improved significantly in recent years. “With resources like donated colostrum becoming available, we are likely to see more miracles like baby Jazeel growing up to be strong and healthy,” he concluded. Would you like to share your miracle birth story? Email to chatback@parent.com and we could publish your letter. Do let us know if you'd like to stay anonymous.